"I want my freezer back." With those words, my wife, Elle, marched out of the house carrying 17 newspaper-wrapped bundles of cryogenically preserved apple cores, broccoli stalks, tea bags, eggshells, and carrot peelings and dumped the whole frosty lot into our giant yard-trimmings bin. We both knew this day was coming. The appliance in question, an Energy Star-rated Danby we still intend one day to fill with a bulk order of free-range beef, was always meant to be a stopgap solution to our disposal crisis. Our family generates more than its fair share of kitchen waste, largely due to the painfully expensive organic vegetables we very briefly place in front of our two small children at mealtimes before dumping them in the scraps bowl. The parenting handbooks tell us to keep trying, and so we do, year after year, while Duncan and Sabrina remain committed to their individual scurvy and malnutrition programs. Until recently, their premium castoffs had landed in our "rodent resistant" black plastic compost box, on the way to the garden as rich soil. That was before the rats came. I won't say how many--my skittish neighbors might be reading this. Let's just say it was more than one. The little scamps not only got into the box, but they also eluded my creative attempts at eradication. Reluctantly, I took the compost off-line. For a couple of weeks, I sheepishly dumped my organics in the garbage can. But trashing all that potential soil felt ethically and morally wrong, sort of like, say, cheating on a three-mile family "fun run" by sneaking your sniveling kids through a shortcut--something I, of course, would never do. My friend Morganne came to the rescue. 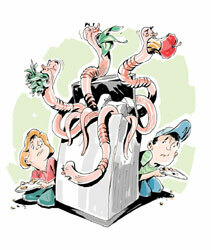 The cofounder of a zero-waste action group, she happened to be placing a bulk order for "vermicomposters"--worm farms. The compact unit could stay in our mudroom, she explained, and "if properly maintained," it would be easy and odorless. No muss, no fuss, no bubonic plague. We forked over $65 and welcomed several hundred red wrigglers into our home. The first few weeks went well. But the poor invertebrates simply could not keep up with my fussy children. Uneaten scraps began to rot and smell. The fruit flies came next, thick clouds of them. My clumsy efforts to restore harmony to this troubled ecosystem, with an aerating fork and fistfuls of shredded newspaper, flopped. Our wrigglers evidently required even more attention than our children. This vermicompost crisis demanded decisive action. I stuck the worm farm out on the porch and started hoarding our surplus biomass in the freezer. Every couple of days, I'd spread the sports pages on the kitchen island, dump the putrefying contents of our countertop scrap bowl, wrap the dripping mess up like a Christmas present, and tuck it into the Danby. Problem solved! At least for a little while. "I can't even find our frozen berries in there," Elle complained. "That's it. I've had it. No more compost in the freezer." "But we can't mix it in with the yard waste," I wailed, eyeing the already thawing newspaper bundles atop a heap of grass clippings in the bin. "The rats will come back!" "You want to save the world?" she asked. "You figure it out." And so, when nobody was looking, I threw 17 frozen packages of remaindered tomatoes, blackened bananas, and petrifying avocado peels into the back of my car, pulled a tarp over the contraband, motored over to Morganne's house, and tossed the lot into her garden bin. (I trust she isn't reading this either.) In the meantime I've gone back to stocking the Danby, at least when Elle isn't looking. (I hope no one is reading this.) A little creative labeling might help--until the inevitable moment she tries defrosting one of my parcels for Sunday dinner. Maybe by that time the worms will be hungry again. James Glave is the author of Almost Green: How I Saved 1/6th of a Billionth of the Planet (Skyhorse Publishing, 2008). Illustration by Tim Bower; used with permission.